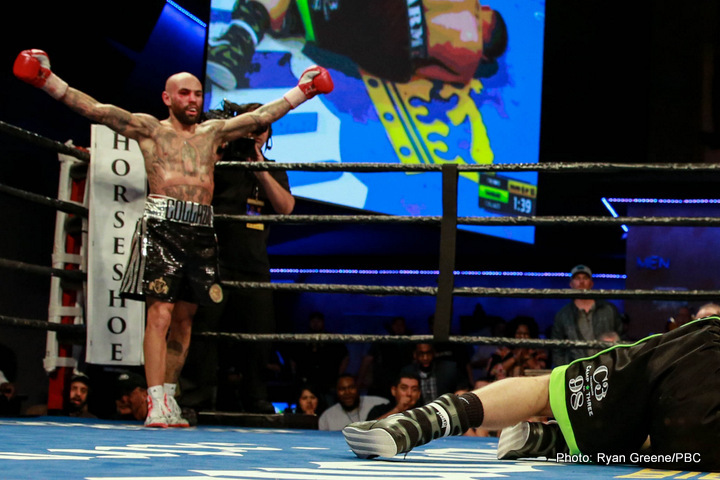 Luis Collazo KOs Sammy Vasquez! 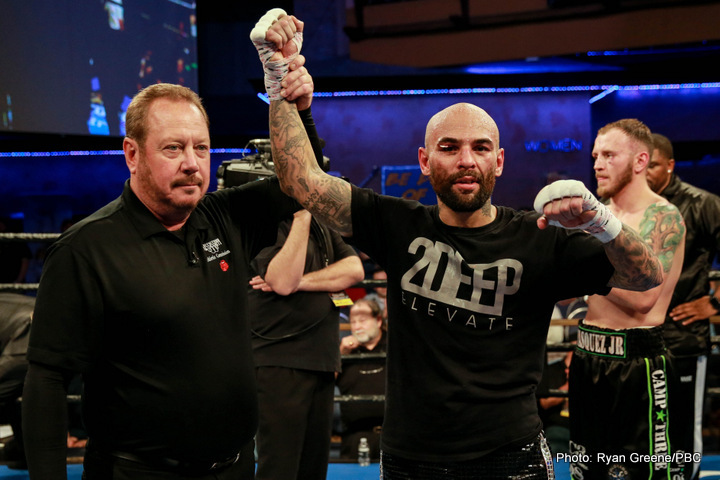 Former world champion Luis Collazo (37-7, 20 KOs) delivered an early “Knockout of the Year” candidate with a sixth-round knockout of welterweight contender Sammy Vasquez Jr. (21-2, 15 KOs) Thursday night in the main event of Premier Boxing Champions on FS1 and FOX Deportes from Horseshoe Tunica Hotel & Casino in Tunica, Mississippi. Ghvamichava was able to work his way back into the fight with an increased work rate in the middle rounds as he began to find openings in Ugas’ defense. Referee Bill Clancy deducted a point from Ugas in round eight after multiple warnings for low blows. In a showdown of unbeaten super lightweight prospects, Chicago’s Eddie Ramirez (16-0, 11 KOs) earned a stoppage victory after nine rounds of action against Houston’s Ryan Karl (13-0, 9 KOs). Karl’s corner stopped the fight before the 10th and final round. The momentum swung to Ramirez for good starting in the seventh round, when another right hand connected with Karl and opened up a cut over Karl’s left eye. A late flurry by Ramirez in round nine as he staggered Karl near the ropes and forced him to hold Ramirez. 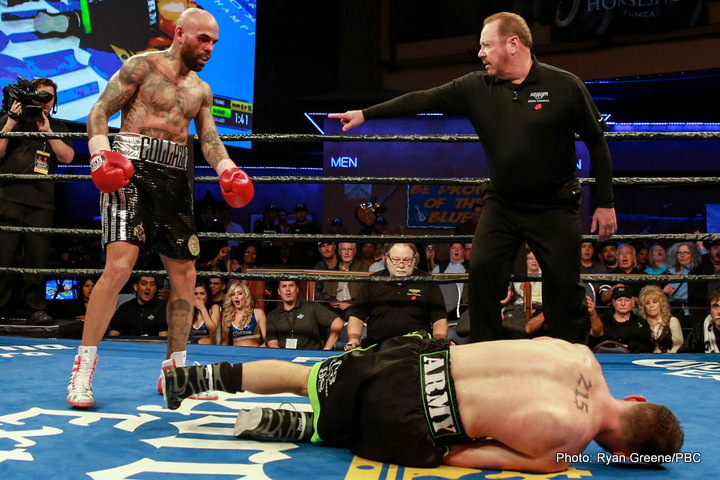 Karl was able to finish the round, but did not answer the bell for round 10 as his corner put a halt to the fight. “Going into the fight I knew he didn’t like the body shots. In the locker room my team was telling me that he’s going to be waiting for it. We wanted to touch him soft down low and then go up top. We opened him up. We both tried to line up the hook and mine landed first. “I’m a slow-starter. I’m better from a distance and I have the experience. I’m 35 but I still feel like I have a lot left in the ring. “I’ve learned a lot about myself. I’m completely dedicated to this sport and ready to keep moving forward. Everyone said I was faded but now I have the opportunity to keep going. “Sammy caught me with some good shots. He got me with a big overhand left. He’s a strong fighter. “I felt like I was starting to get in my groove. He just caught me with a really great shot at the right time. “I knew his big punch was the right hook. I was working on keeping my hand up to block it. I dropped it at the wrong time and he got me. “I boxed from a distance like we prepared. I thought that I was in control and I thought I won easily. “I was surprised it was a split-decision. I thought I won most of the rounds. He was a very tough opponent but I was ready for him and I did what I wanted to do. “I’m disappointed in the result. It’s hard to put into words. It was a close fight. I thought a lot of his shots were being blocked and I thought I countered well. “I’m happy. We worked hard and this is another step. We’re going to keep working hard. I have what it takes to be a world champion. “Ryan Karl is a tough fighter. He came to give it all he had. He didn’t want to quit, but we broke him down and got the win. “Karl and I both came to win. Someone’s perfect record had to go. There was no quit in him. I was going to finish the fight in the last round. “My plan was to break him down. I never wanted this fight to go to decision. I did what I had to do. “I’m aiming high. I want to fight the best. If I keep working hard everything is going to take care of itself and I’ll get where I want to. “I just wasn’t on tonight. I couldn’t hit my right hand how I wanted to. I give him all the credit. My timing wasn’t right. He looked great and I looked mediocre. 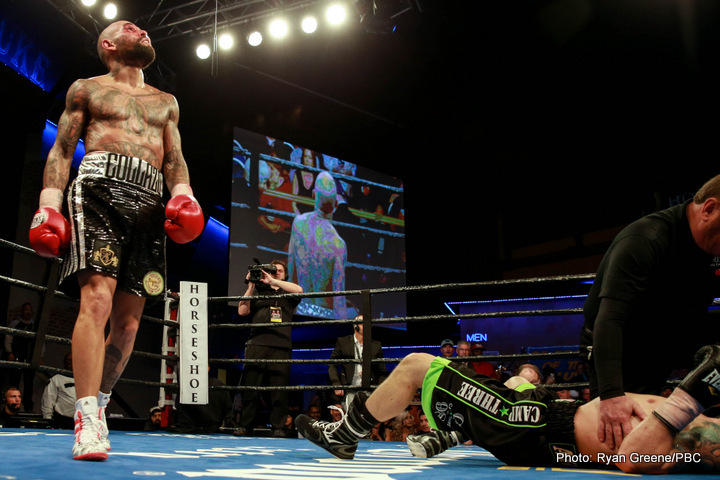 You are here: Home / Boxing News / Luis Collazo KOs Sammy Vasquez!